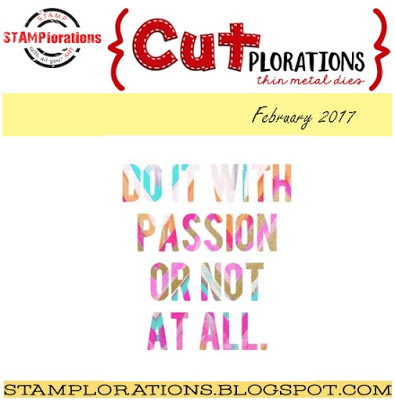 It's Inspiration time at STAMPlorations, and today we're focusing on Shery's stamps. I've had a run on baby girl cards lately so I needed to replenish my stash. 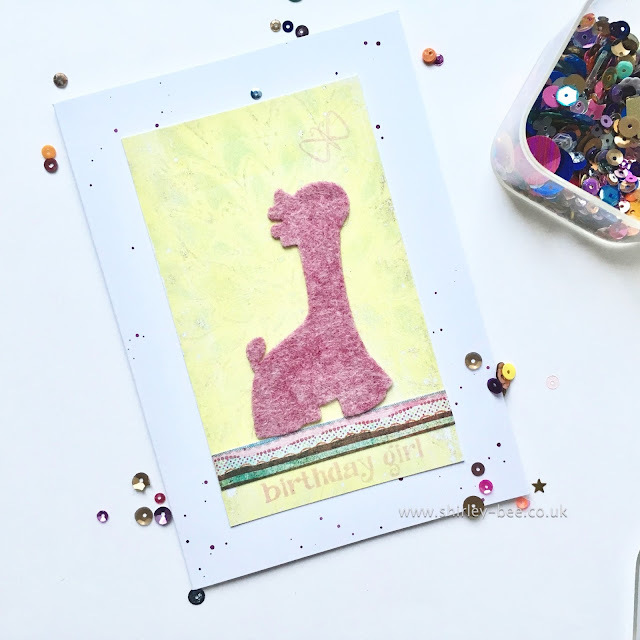 For this card, I stencilled the hearts in Spun Sugar onto a white panel, then stamped the rocking horse from Heaven Sent, my go-to set for baby cards. I added the loopy border from Artsy Border Maker as a base for the rocking horse, and added the sentiment, also from Heaven Sent. 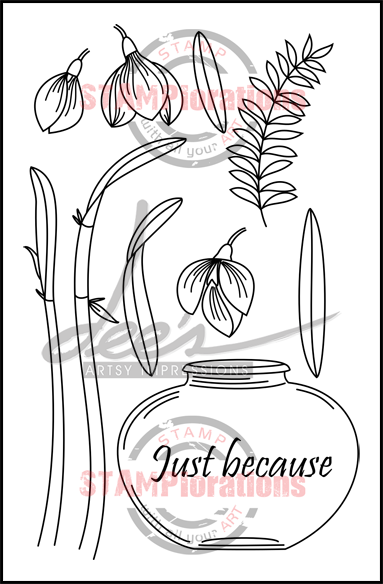 For the next week, all Shery's stamps are 10% off (no coupon needed), and Art Is is 20% off. And if you use my code STAMPGIRLSHIRLEY you'll get another 20% off these and any other stamps, stencils and dies in the store. 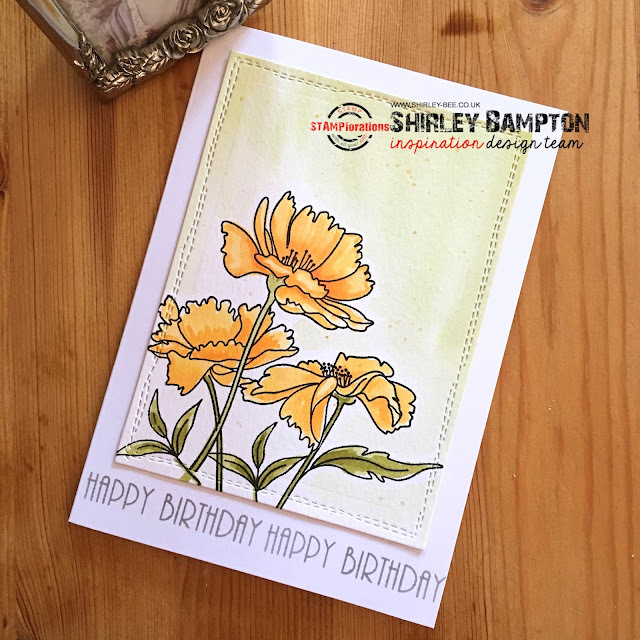 Pop on over to the STAMPlorations blog for some more fabulous inspiration from the Design Team, and don't forget to comment for your chance to win a gift certificate to the store. STAMPlorations are sponsoring the challenge, so I couldn't resist playing along with my Houses set - perfect for this theme. The trees are from Houses Extras, the butterfly from Winged Things, and the sentiment from Sentiment Builders: Happy and Sentiment Builders: Christmas & New Year. If you play along at the TIME OUT challenge, you'll be in with a chance of either winning a $10 gift certificate or choosing any stamp set as used by the TIME OUT DT. I'm also playing along at Simon Says Wednesday Challenge - Anything Goes. Welcome to another STAMPlorations Inspiration Tuesday. 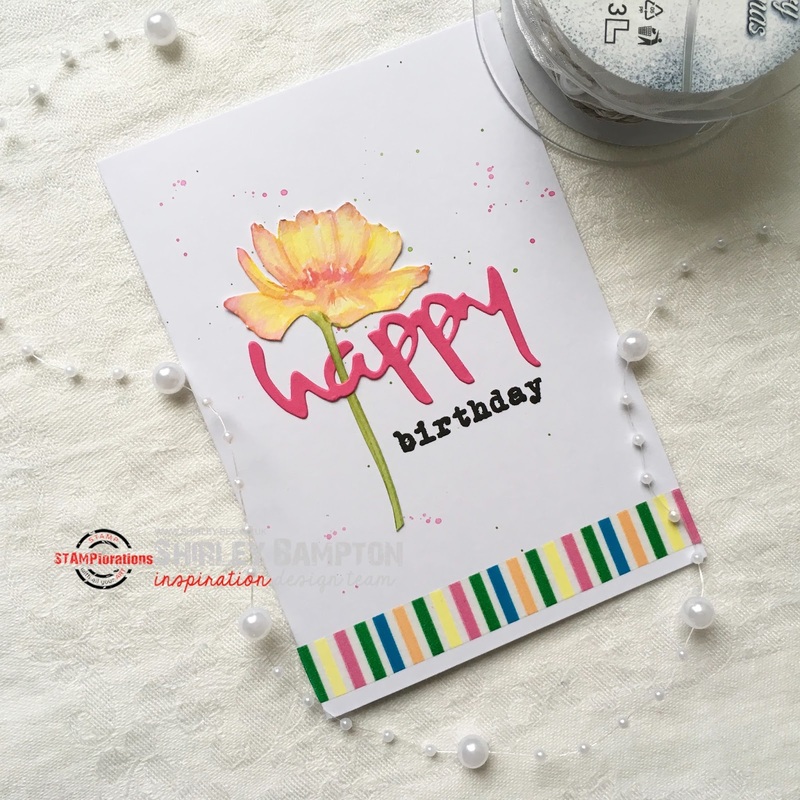 Today we're focusing on Deepti's stamps, Dee's Artsy Impressions. I've used some flowers from Blooming Buds and the sentiment from Balloons and Banners. Once I'd finished colouring the panel I cut it with the Crazy Double Running Stitch die. This week there's 10% off Deepti's stamps (no coupon needed). 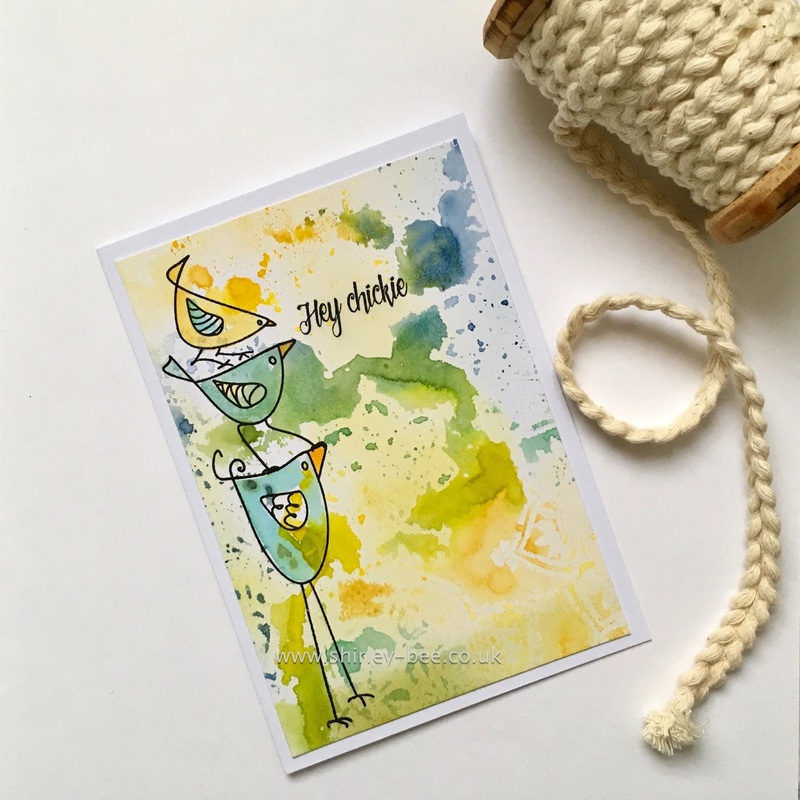 Chico Goes Bananas is 20% off, and if you use my code STAMPGIRLSHIRLEY you'll get another 20% off that (and any other stamps, dies and stencils in the store). 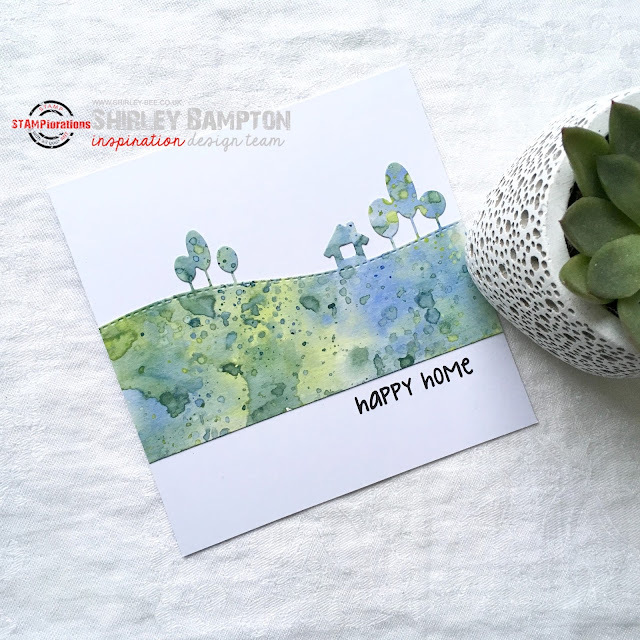 Pop on over to the STAMPlorations blog for some more inspiration from the Design Team, and don't forget to leave a comment for a chance to win a gift certificate to the store. 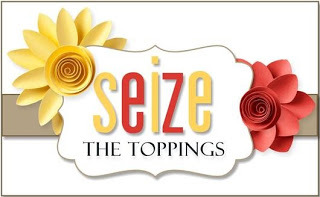 Hello, and welcome to a new challenge at Seize The Birthday! Our topping for this challenge is Inlay Diecuts. You know, diecut shapes, letters, numbers, etc. then either replace them with the same diecut shape in another colour, or patterned paper or paint the diecuts before replacing them, like I did. 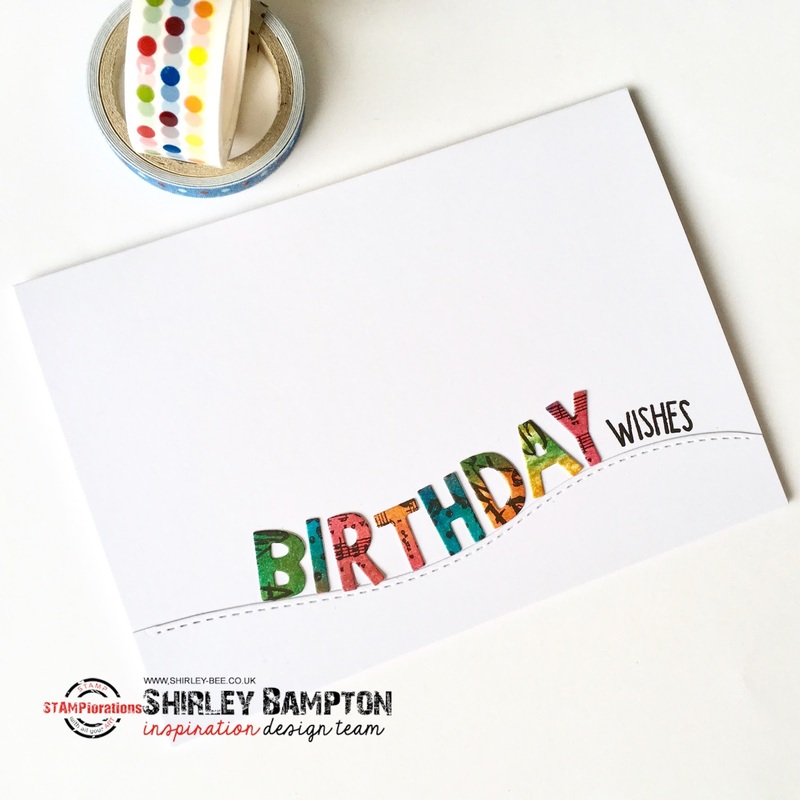 Pop on over to the Seize The Birthday blog for some more fabulous inspiration from the rest of the Design Team, then play along with us. 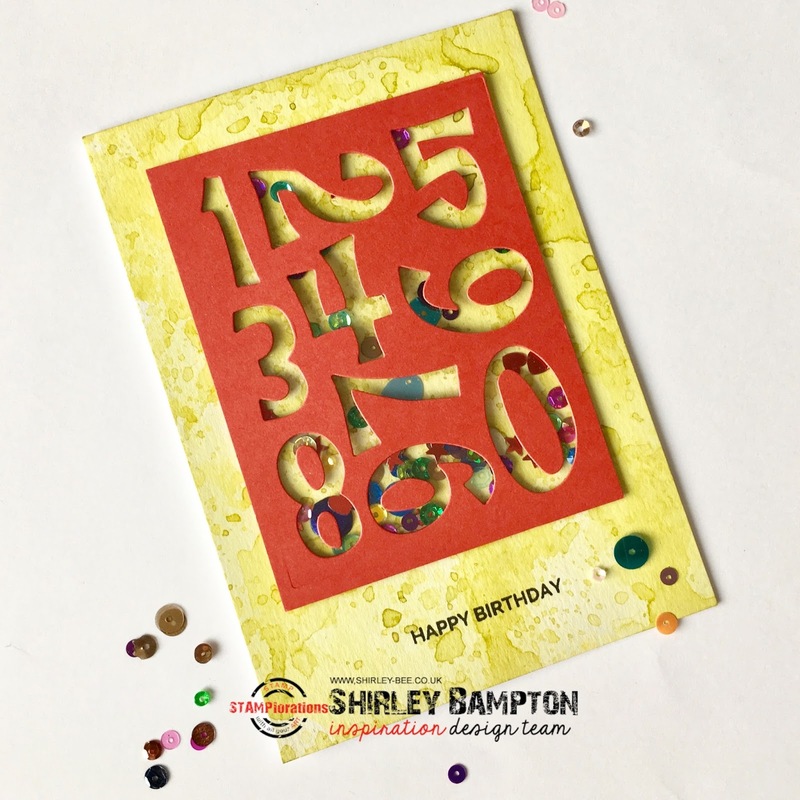 If you don't fancy inlay die cutting you can still play along with any birthday-themed creation. 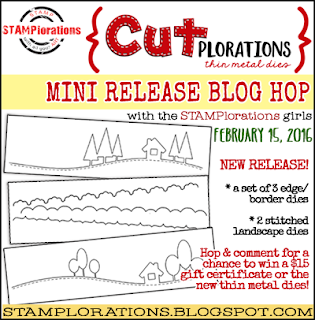 We've got a mini release for you today at STAMPlorations with these gorgeous edge/border stamps. For my first card I've used the Stitched Winter Landscape, but I've gone for a bright, summery theme. The card was a scrap from when I made my phone cover, which I die cut then stamped some images from the Scribbly Splattery Grunge set, and then trimmed the base on a wavy line. The sentiment comes from Sentiment Builders: Christmas & New Year. For my second card I used a panel of splattered Distress ink to cut out the Stitched Spring Landscape, this time leaving a wider border. Pop on over to the STAMPlorations blog for some more fabulous inspiration from the team, and don't forget to comment here and on the other blogs for your chance to win the dies. 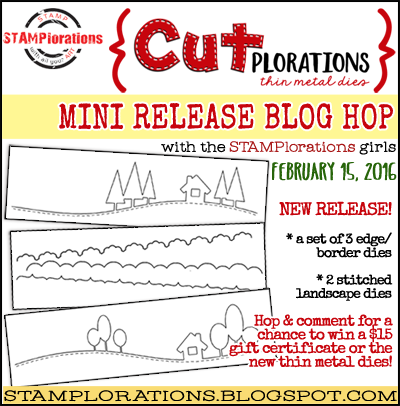 Are you playing along with the STAMPlorations CUTplorations challenge? 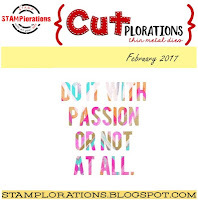 All you need is to use a die cut (preferably CUTplorations, but other brands are acceptable provided you've used other STAMPlorations product somewhere on your entry). So. In my stash I found this stencilled background from a few months ago that I couldn't decide how to use at the time, so I'd just left it. The stripy leaf veins reminded me of the stripes in the inspiration graphic, so I just cut another Happy, this time in a maroon shade, painted another flower from Deepti's Blooming Buds set, and added the 'birthday' from Shery's Big Greetings set. 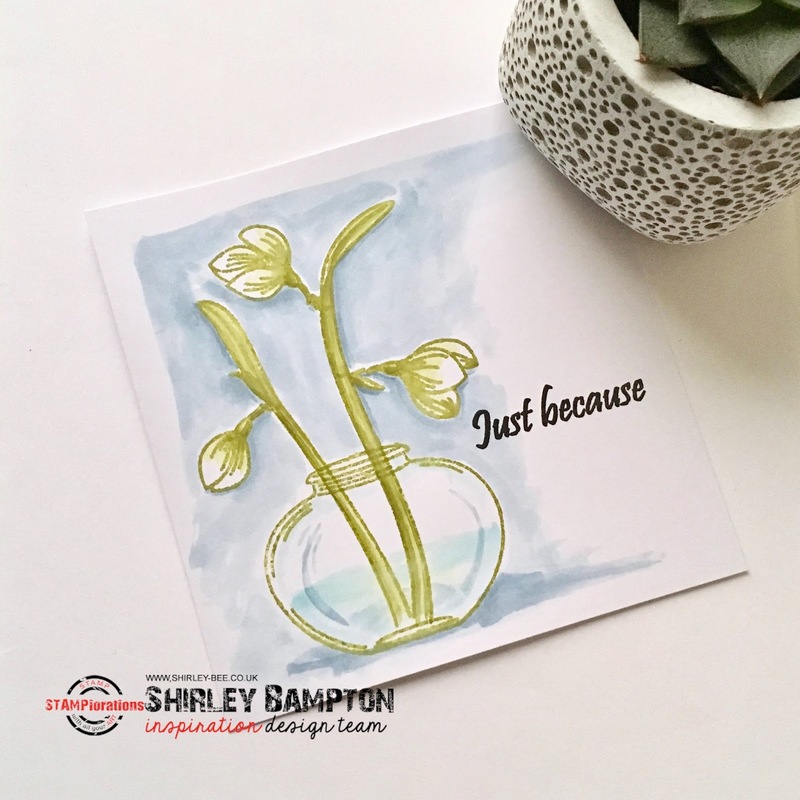 Pop on over to the CUTplorations challenge page for some more fabulous inspiration from the rest of the Design Team, and join in with your STAMPlorations products for a chance to win more! It's Inspiration Tuesday at STAMPlorations, and today we're featuring stamps from Becca's line, Big Grins by Becca. 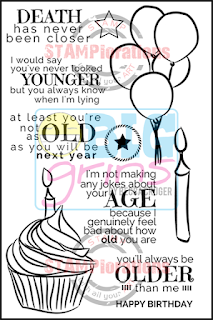 I'm still playing with Becca's new set, A Snarky Birthday To You. I'd stamped all the candles on a piece of scrap card with the intention of colouring them then cutting them out (that's why the colouring is even looser and sloshier than usual) but then I decided that I liked them just as they were. I stamped the sentiment onto a scrap of blue card, added a shadow to 'age' then collaged the pieces with some scraps. Quite like it. Pop on over to the STAMPlorations blog for some more fabulous inspiration from the design team, and leave a comment for a chance to win a gift certificate. There's 10% off all Becca's stamps for the next seven days (no coupon needed), and there's 20% off Caffeinated Christmas. 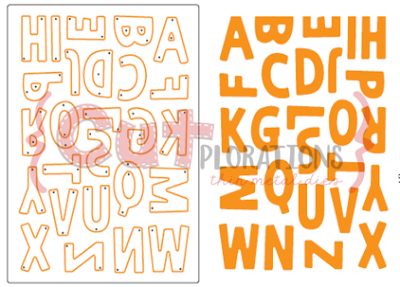 And if you use my code STAMPGIRLSHIRLEY, you'll get an extra 20% off any stamps, stencils and dies in the store. Bargain!! 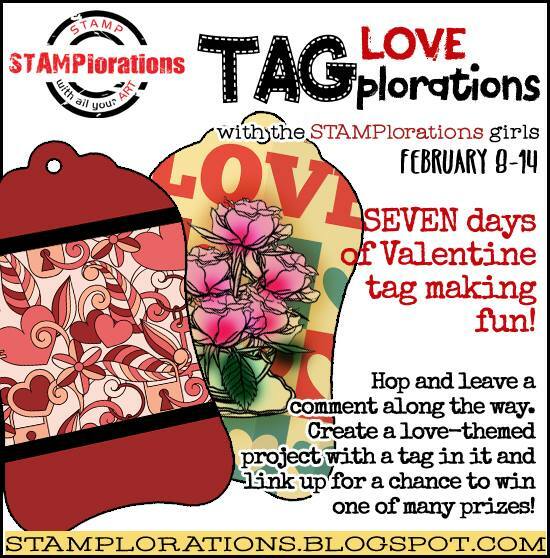 STAMPlorations is sponsoring the current Cupcake Inspirations, so some of the STAMPlorations team are playing along. I stamped CityGirl in Versafine Onyx Black, then watercoloured with Black Soot and Candied Apple Distress Inks and fussy cut her. 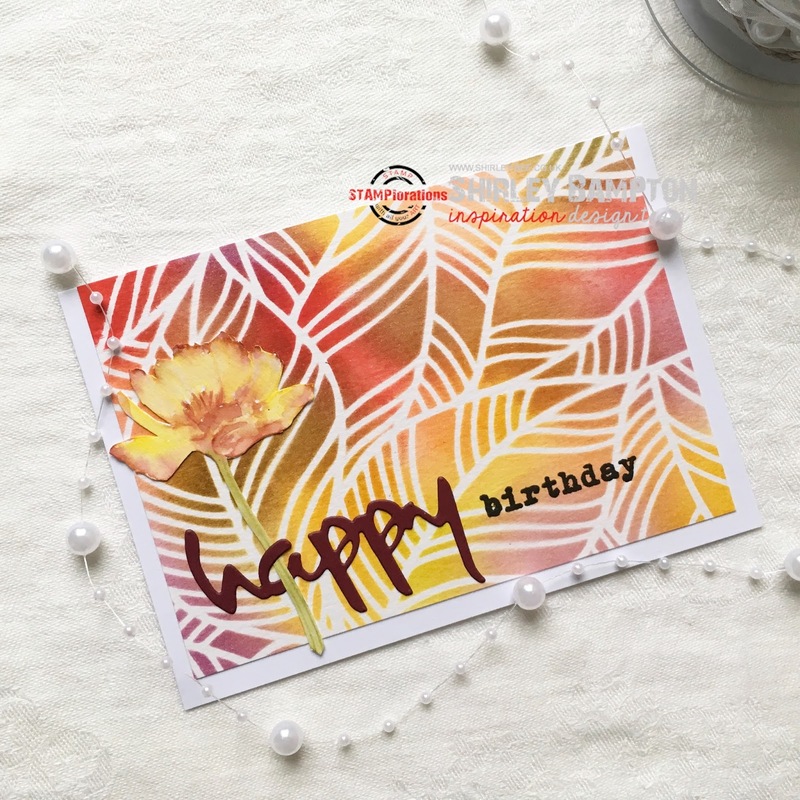 On my base card I stamped the sentiment from Shery's new set, Noteworthy 2, then added some chevrons and a squiggle from Scribbly Splattery Grunge before adhering CityGirl. 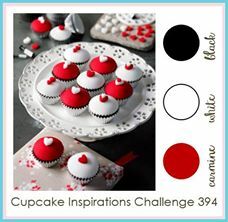 Pop on over to the Cupcake Inspirations blog for the challenge, and play along. 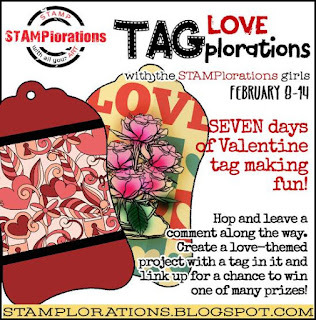 STAMPlorations is having seven days of tag-making fun, and I'm joining in with Day 4. All you need to do to play along is create a love-themed project with a tag in it. I've used the largest tag die from Luggage Tags Nesting Dies. I sponged it all over with Victorian Velvet Distress Ink, then sponged more ink through the Doodled Heart stencil. I stencilled Cosmic Shimmer Gold Pearl texture paste through the A Bloom and Three Buds stencil. The sentiment and two stamped hearts come from my new set, Two of Us, and the bottom heart was cut from the new Clustered Hearts die. 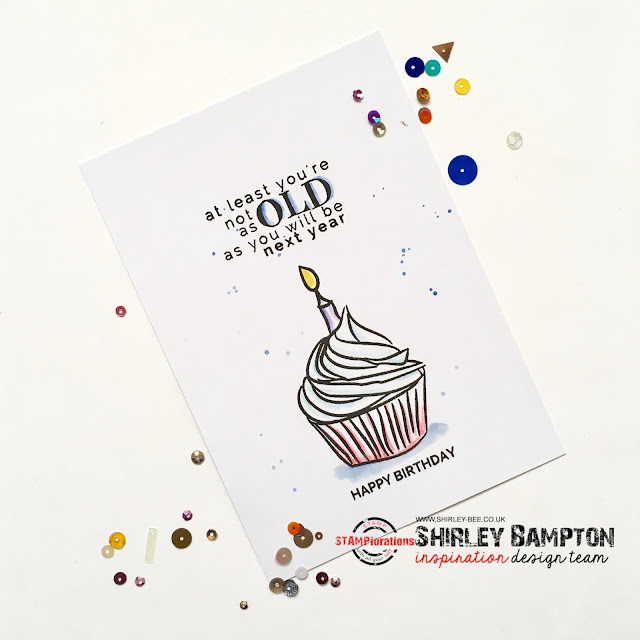 So pop on over to the STAMPlorations blog for some fabulous inspiration from the team, and join in for your chance to win. I've used stamps from The Bee's Knees Party Dresses and City Girl, along with a CUTplorations edge die. I stamped the images onto the sponged card panel, then masked them while I spritzed water over the sponging. The trimmed panel was then adhered to the die-cut panel, then to the card base. 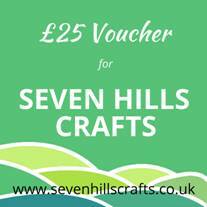 Our sponsor this month is Seven Hills Crafts who are offering a £25 voucher to one randomly chosen winner. The winner chosen by the Design Team will get their winning entry published in Craft Stamper magazine, a guest design slot in a future challenge, and a winner's profile. 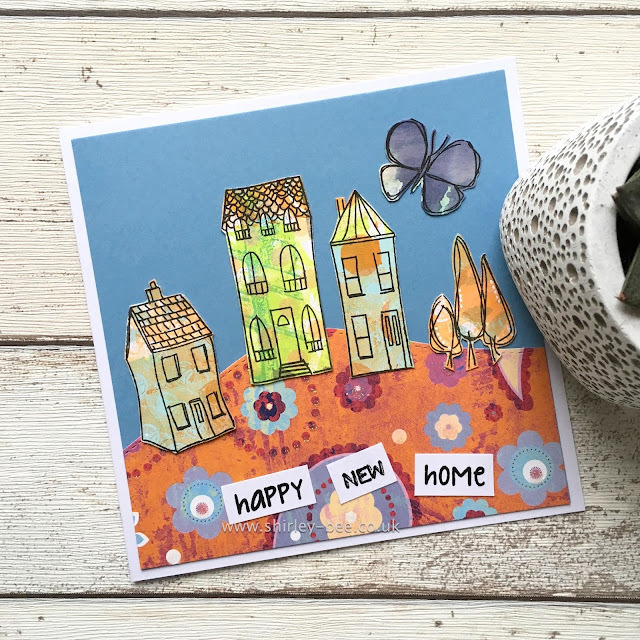 Pop on over to the Craft Stamper blog for some more fabulous inspiration from the Design Team, then join in to win! 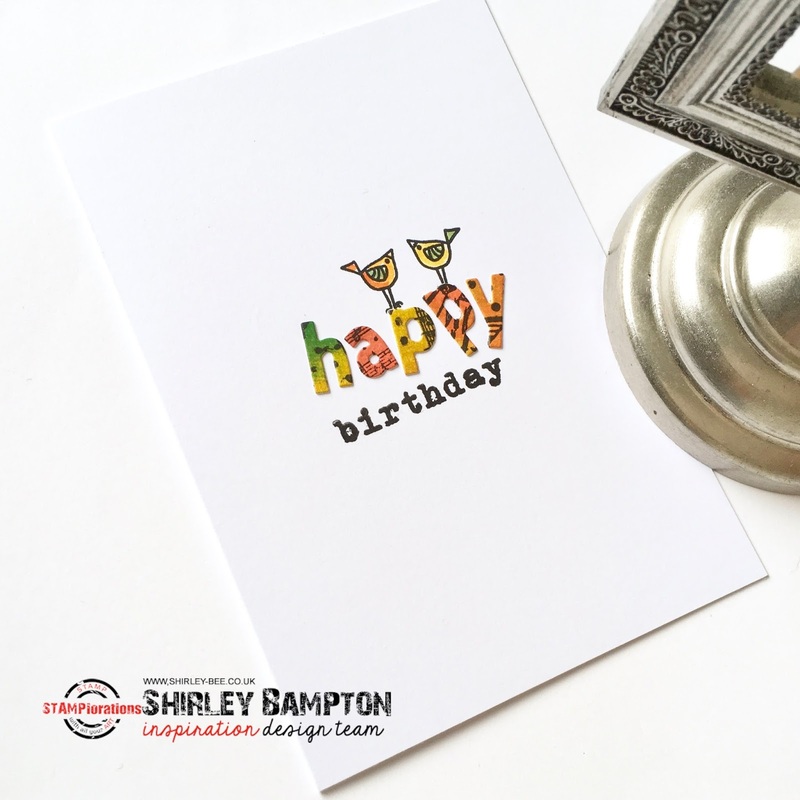 It's Inspiration Tuesday over at STAMPlorations, and today we're focusing on The Bee's Knees range. I'm still playing with Fowl Play :) For this card, I stamped the chick bodies onto patterned paper then cut them out and stacked them onto white card, grounding them with one of the stamps from Scribbly Splattery Grunge. 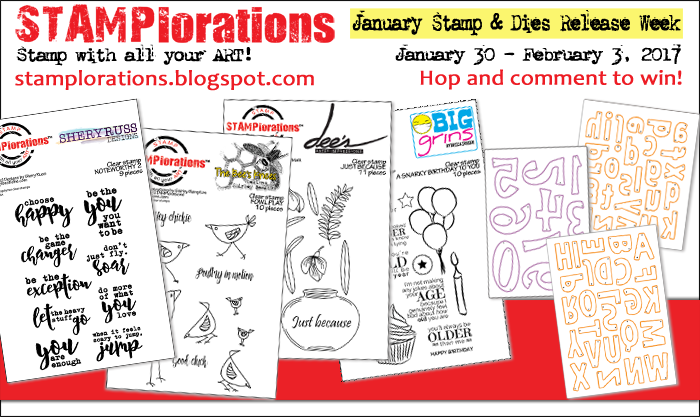 From 7-13 February all The Bee's Knees stamps (except Fowl Play) are 10% off, no coupon needed. 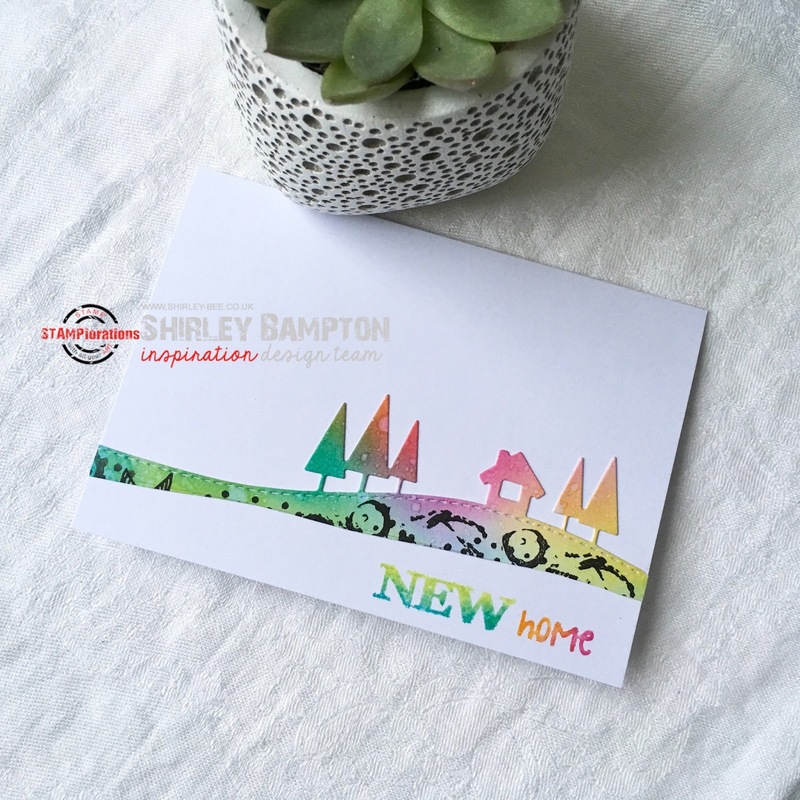 There's an extra 10% off Houses Extras, and if you use my code STAMPGIRLSHIRLEY you'll get a further 20% off all stamps, dies and stencils. 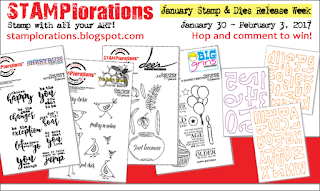 Pop on over to the STAMPlorations blog for some more fabulous inspiration from the Design Team, and don't forget to leave a comment for a chance to win a gift certificate. The starting point was the striped washi tape, then I chose hot pink for the Happy word die. 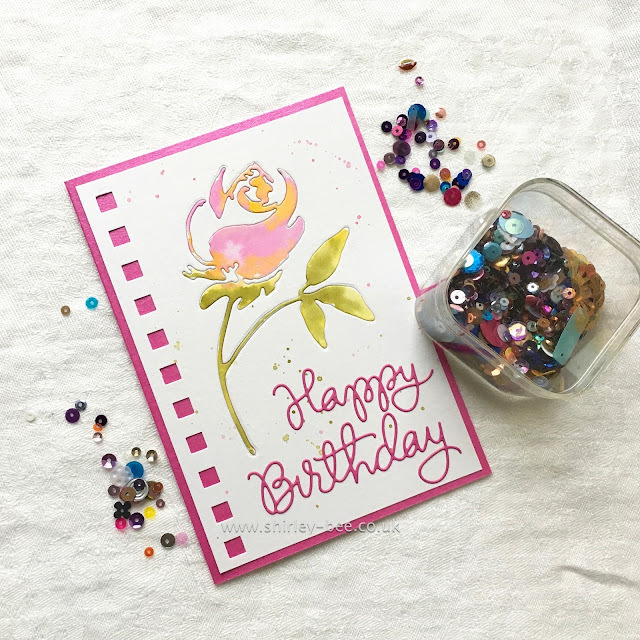 I thought I'd go for a soft look by stamping a flower from Deepti's Blooming Buds in Distress Inks then giving it a colour wash. Fussy cut it out, threaded it through the word die and added 'birthday' from Shery's Big Greetings set and it's done! I found this vintage linen table napkin at the back of my linen cupboard to use as the backdrop for my photos - pretty, innit? Pop on over to the CUTplorations challenge page for some more fabulous designs using the inspiration graphic, and play along with us. 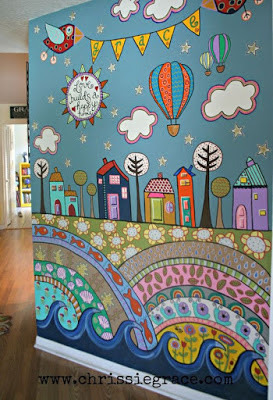 How will it inspire you? Obviously there is only one 'p' in the alphabet, but you can get away with using the 'd' from the same pass. It's not exactly the same shape, but when you're using random colours and stamping, it's not too glaring. 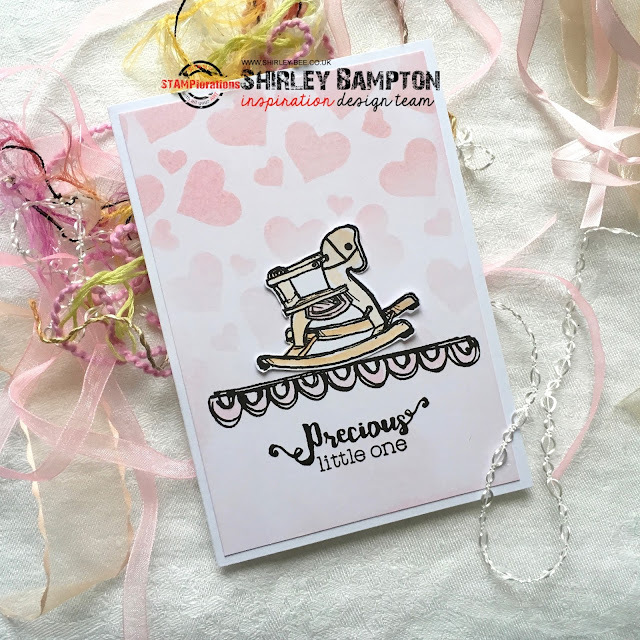 All the stamps and dies in this release are 5% off until 10 February. 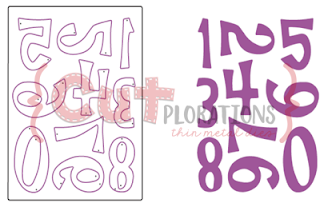 And if you use my code STAMPGIRLSHIRLEY you'll get another 20% off these and any other stamps, dies and stencils. 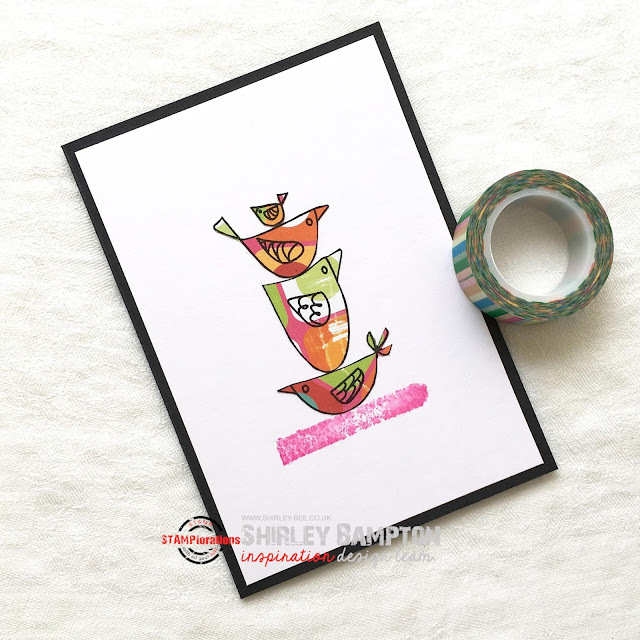 It's a new month, and a new challenge at Craft Stamper Take It, Make It. All you need is a stamp or two, and you're in! I've used some images from The Bee's Knees Fowl Play on a monoprint background tat was in my stash. We've got a fabulous sponsor for you. Seven Hills Crafts are providing a £25 voucher to their online store to one lucky randomly chosen player. Here's a reminder of our guidelines. We're not strict, but if your entry doesn't meet the guidelines, it's not eligible for any prize. 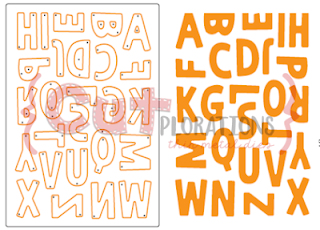 Rubber or polymer stamps must be used. Pop on over to the Craft Stamper blog for some more fabulous inspiration, and play along for your chance to win. We've got a new challenge for you at Seize The Birthday, and this time it's FELT. Felt is just made for die cutting! I got some gorgeous marled felt in several colours the other week, so this was a perfect opportunity to use some of it. I cut the giraffe (Dee's Artsy Impressions) from the pink marled felt and laid it on a gelli plate background from my stash. I grounded the giraffe with a strip of patterned paper from my stash (yes, I save strips of paper for just such occasions) and stamped the sentiment under that in Brilliance. I also stamped a butterfly from Winged Things above the giraffe's head. Pop on over to the Seize The Birthday blog for some more fabulous inspiration from the Design Team, and play along with us. If you don't want to use felt, you can still play along with any birthday project. 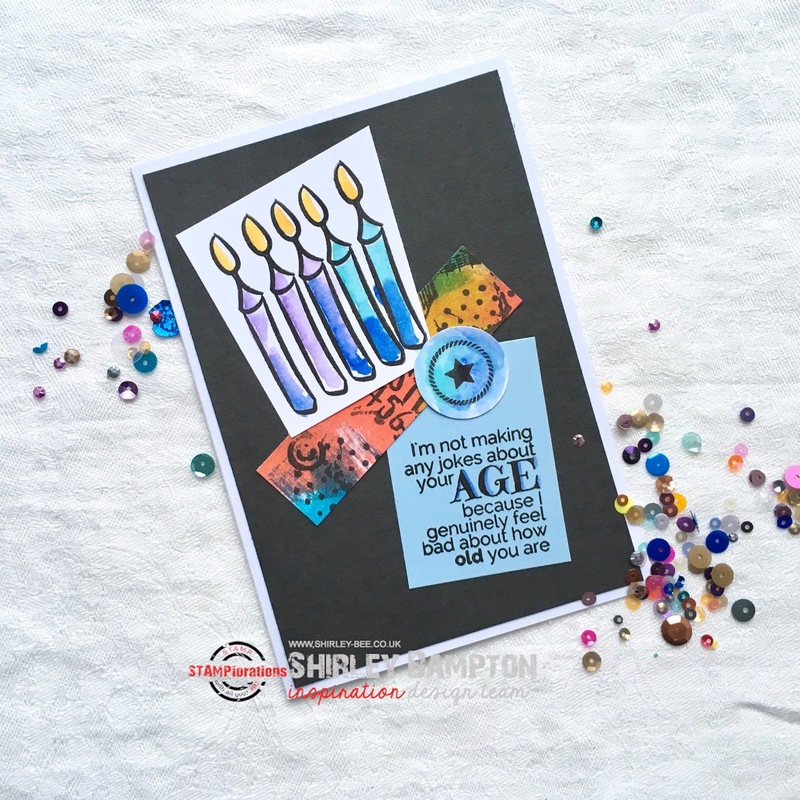 It's Day 4 of the STAMPlorations release week, and today Becca's in the spotlight with her new set, A Snarky Birthday To You. 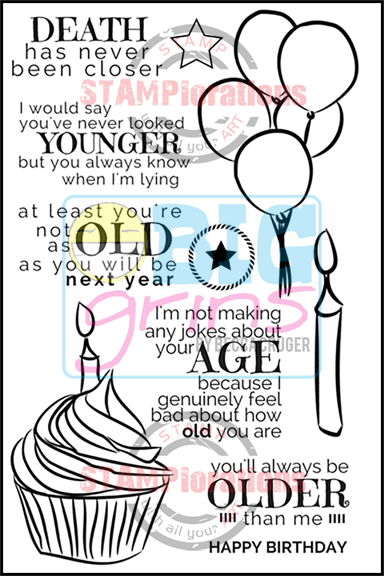 There are some great snarky sentiments in this set to go with the images. I chose the cupcake and gave it a hint of colour, and added a shadow to emphasise the 'old'. What's not to like? Get commenting!! 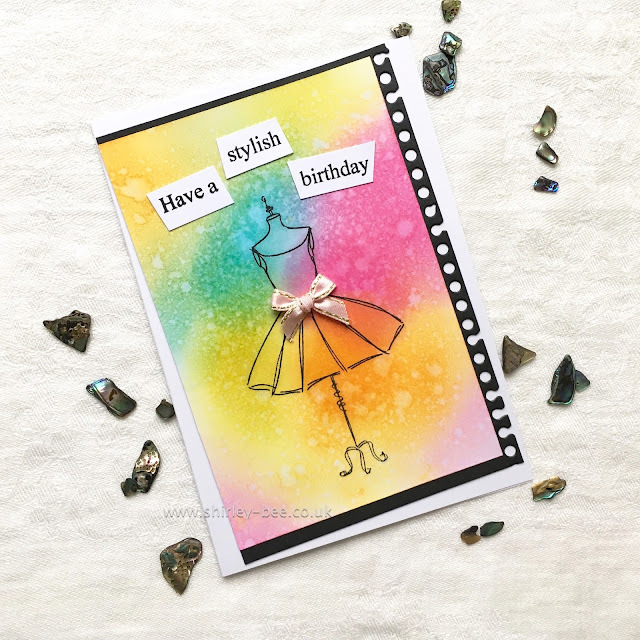 All the stamps and dies in this new release are 5% off until 10 February. And if you use my code STAMPGIRLSHIRLEY you'll get another 20% off, even on sale prices! It's Day 3 of the STAMPlorations release week, and today we're featuring Deepti's set, Just Because. I stamped the images in Peeled Paint Distress Ink, then used a wet paintbrush to draw the colour in, adding more where necessary. I watercoloured the background with Stormy Sky. 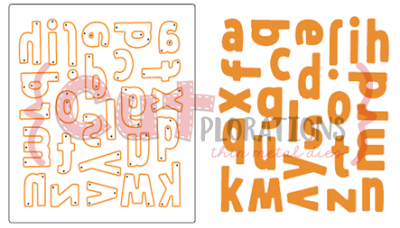 All the stamp sets and die plates in this release are 5% off until 10 February. 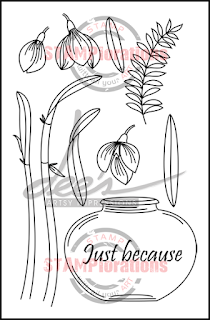 And if you use my code STAMPGIRLSHIRLEY you'll get an extra 20% off these and any other stamps, dies and stencils in the store, even on sale prices!